Most parents go about introducing solids to baby in the same way: by offering spoonfuls of mush as directed by the parent, on their schedule. What parents don’t know is that this is a recipe for fussy-eating habits and dinnertime battles! Because of this, a growing number of children are becoming obese, and fast-food and other junk is becoming a common part of the average diet. Baby-led weaning (BLW) is a growing trend that a lot of parents are getting into. What is it? It’s simply the concept of letting baby feed himself, while slowly introducing new foods to their diet alongside milk or formula. 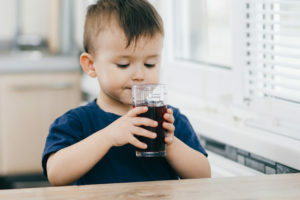 Many consider BLW as a superior alternative to spoon-feeding their child, and it’s fast-gaining a reputation as being the best way to instill healthy eating habits and attitudes from an early age. The term “baby-led weaning” can sometimes be misleading to new parents. It doesn’t mean to completely stop breastfeeding or feeding formula; it means to start introducing solids. The fundamental difference in baby-led feeding compared to regular weaning is the order children learn to eat. When feeding mush, the child first learns to swallow and then chew. But in BLW, the child learns to first chew, and swallowing comes later. Fisher Price Deluxe Booster Seat: You need a good, cheap high chair with a removable tray, and this one is perfect. The tray is simple to remove and clean, plus you can even throw it in the top rack of the dishwasher. I don’t like stand-alone high chairs because of the bulk, and this one sits on top of any existing chair. Bumkins Waterproof Sleeved Bibs: BLW is messy. Very very messy. I recommend full-sleeve bibs to minimize the amount of food that’s going to get all over baby, and these ones are nice and easy to clean. Pyrex Glass Containers: Baby simply isn’t going to eat all of the food at any given meal, so you’ll need somewhere to store the leftovers. These glass containers are perfect, and I wouldn’t recommend cheaper plastic ones. Get these! OXO Tot Training Spoon & Fork: Forget getting a whole set of silverware; all you need is one spoon and fork. That’s it! SUGARBOOGER Jumbo Floor Splat Mat: You need something to put down under the high chair to catch the mess and flung food. These splat mats are perfect for the job. Tutti Bimbi Bamboo Wash Cloths: Wash cloths are absolutely vital, and I love the Tutti Bimbi cloths because they’re made of organic bamboo and don’t irritate the skin. It’s a pack of 6, so you’ll always have one on hand. Less stressful! It makes the whole experience much more fun! Also more messy, but that’s the fun part, right? It’s baby-led in the sense that you’re letting them take the lead, learning at their own pace, while you as a parent avoid getting stressed out over what they’re eating or not eating. Healthy food choices: Because babies are allowed to experience a variety of tastes and textures from an early age, it encourages them to choose healthy foods on their own as they get older. It also practically eliminates the chances of them being picky eaters. Fights obesity: Since babies are allowed to eat according to their appetite, they won’t overeat and won’t develop that bad habit. When parents feed their babies, they often encourage them to finish completely, or at least to have “one more bite” even when they’re obviously not hungry anymore. BLW babies also develop a natural liking for carbohydrates and a lower prevalence of obesity. Develops jaw and chewing skills. 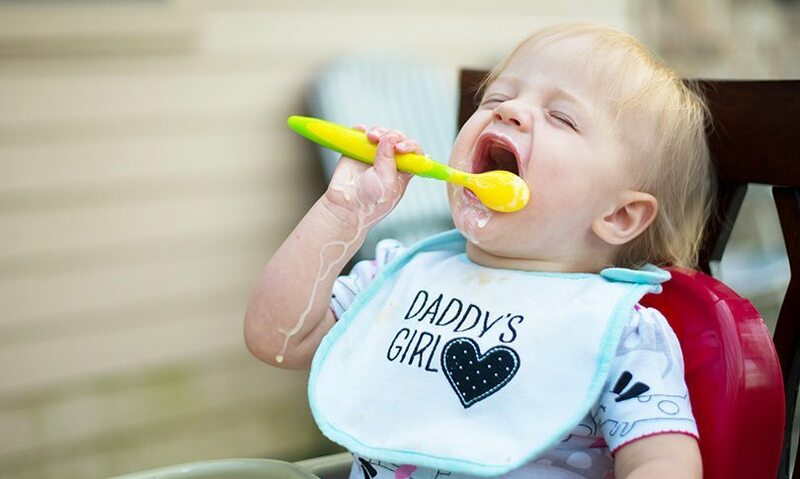 Since babies are encouraged to chew from the get-go, it causes them to develop their ability to chew, which is delayed when babies are spoon-fed, as the puree only has to be swallowed. Develops hand-eye coordination. Having to use their hands and put the food in their mouth does wonders in developing hand-eye coordination. The different shapes and textures of the food and later on the gripping of silverware is great for this. It’s just easier. Having to make purees all the time can be draining and time-consuming. BLW is much more basic and easy! Experts suggest waiting until about 6 months of age before starting to introduce solids, but that doesn’t mean they’ll be ready exactly then. It’s best to keep track of the signs baby is ready and go from there. Baby can sit up well on their own without support. Baby has lost the tongue-thrust reflex and doesn’t automatically push food out of their mouth. Baby shows eagerness to take part in dinnertime and reaches for food themselves. Baby has started to pick things up in a pincer grasp, using thumb and forefinger. Keep in mind this does not mean scooping food into the palm of the hand. 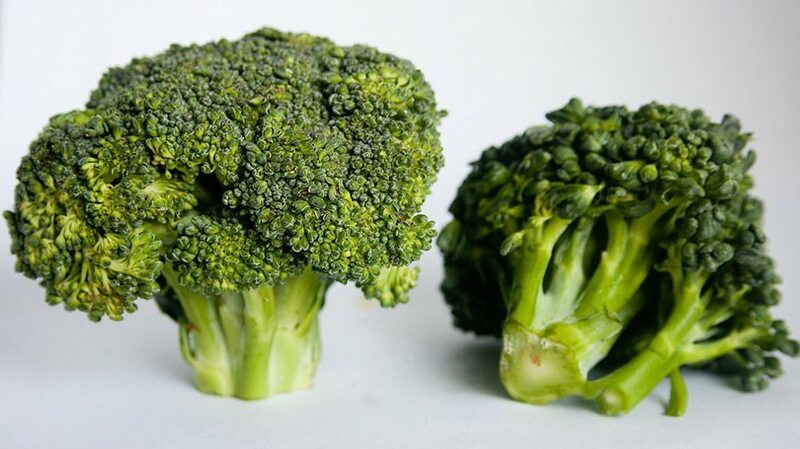 Broccoli is a great first food for baby-led weaning! What Are Good First Foods For Baby-Led Weaning? Banana is a great first food to introduce to baby. Ideally, you’ll cut the banana up into chunks, which are easiest for them to hold and chew on. Melon is also great. Cantaloupe or watermelon is soft, watery and easy to chew, plus it’s super healthy! Avocado is awesome; it’s really soft, full of healthy fats and can be served raw. Not the easiest for baby to eat, but still yummy and healthy. Carrots when steamed are excellent! Easy to hold onto and soft and nutritious when they’re fully cooked. Broccoli is another great one when steamed. Cucubumer is a great BLW food when sliced up. Nice and soft, easy to hold onto and full of great nutrients. Basically, any soft fruits or veggies that are easy for baby to hold onto make great choices for BLW. It’s usually pretty obvious which foods should be avoided. Anything that’s a choking hazard like nuts or peanut butter. A full list can be found here. Foods that can cause allergies. A list can be found here. Anything with added salt or sugar. Salt especially can be awful for the baby’s kidneys. Processed or unhealthy foods. This is self-explanatory. 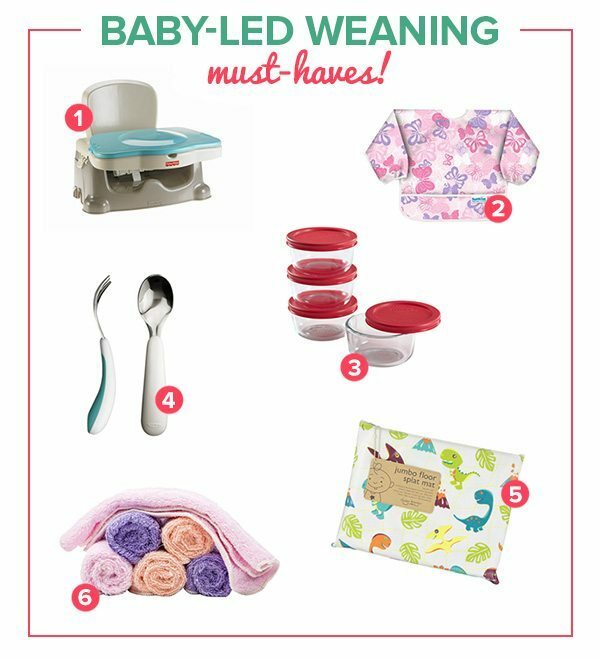 Here’s how to go about baby-led weaning! Choose a good time when baby is neither hungry nor full. If they’re hungry, they can be cranky, and if they’re full they’re not going to be very open to eating even more. You might as well make it as easy as possible. Sit baby at the table with the rest of the family. Ideally, you’ll always do your BLW sessions when the rest of the family is eating; this makes them feel more integrated. Either put them in a high chair or have them sit in someone’s lap, but make sure they’re sitting upright and their head isn’t tilted back to avoid choking. Setup a protected area to account for messes, which are definitely going to happen! I’d recommend putting something easily-washable under the chair; a painting drop cloth works well. Having them eat in just a diaper works, and you should put a good bib on them, too. Offer baby food, ideally the same food everyone else is eating, especially if that’s fruits or veggies. You’ll want to give them things that are easy to handle, and also big enough that they can’t choke on it. Foods with varying textures and consistancies are great to open them up to different things. Don’t use plates or cutlery, which can only serve to confuse and makes things more complicated. Let them eat at their own pace, which is key in baby-led weaning. Set the food in front of them and let them explore and taste as they prefer. Don’t be in a hurry; there’s no rush! They’ll probably want to play with and smush the food at first, so don’t expect them to eat right away. It’s all a learning process. Offer water in a small cup but don’t expect them to drink it right away either. In fact, most children will probably prefer to drink milk from the breast or bottle at first. Baby-led weaning is messy… but it works! Forget “baby food”, meaning the mushy stuff that comes in jars from the grocery store. You want to go with pieces of actual food, preferably soft stuff like fruits and veggies. It doesn’t have to be veggies. If the family is eating spaghetti, it’s perfectly fine to offer it (cut up into small pieces) too. One of the big benefits of BLW is getting baby involved in eating along with the rest of the family. Just make sure it’s not anything with added salt or spices that could irritate. No bowls or spoons, period. Having a bowl on the high chair is just asking for it to be flung across the room! It’s best to put the food directly on the (clean) high chair tray or table. It’s going to be more messy, but BLW isn’t exactly the most neat and tidy of experiences to begin with. Don’t overwhelm them with too much choice. Offer only a few pieces of food at once; too much can leave them feeling overwhelmed. Don’t put food directly into baby’s mouth. The whole point is to let them take the lead, and forcing them can also lead to choking. If baby gags, don’t panic. It’s simply their way of moving food around their mouth! I know it can be alarming but it’s really nothing to worry about. The BLW time can be kind of frustrating to babies. They’re pretty hungry, and feeding themselves isn’t the easiest thing in the world. It’s best to time these sessions between milk feeds so baby isn’t cranky and hungry. It makes things easier. Put a painting drop cloth under the high chair to catch messes, which are definitely going to happen. These cloths are cheap and made of plastic, and you can wash them off and hang them to air dry. Eating outside is also a good idea if the weather is warm and nice. It’s a great way to deal with the mess. Don’t get stuck on 3 meals a day. Just go with whatever schedule works best for you and baby. Sometimes they just won’t be hungry, and sometimes you won’t have time. Just go at your own pace. Take pictures! This is going to be an experience to remember, and it doesn’t last very long. You’ll appreciate having pictures to remind you of the fun and messy times you had. If you’re not totally sold on strictly baby-led weaning, you’re not alone. Some experts recommend doing BLW, but also mixing it up with spoon-fed purees, which might be more realistic for some parents. This is especially important, as the study I linked to showed that about 6% of children develop more slowly than others, meaning they pick up on BLW more slowly and end up malnourished. Some parents are under the misconception that BLW should be completely hands off, and that doesn’t mean you should set food out in front of baby and walk away. A little encouragement and help doesn’t hurt at all, and it’s not going to be any detriment to the effectiveness of BLW. It’s also very possible that your baby won’t get all of the nutrients she needs. By 6 months, babies need a lot of iron, and they won’t get enough of it from solely breast milk; they need food sources of iron. Since it’s very hard (if not impossible) for BLW babies to chew and eat meat, this can be a problem. This is another reason why the half n’ half approach is good. Why not give baby a piece of cooked pork chop to chew on, but pulverize some to make sure they’ll eat some? You don’t have to follow what BLW advocates say exactly. For many people, it’s just not realistic to never intervene ever in the feeding process. Some foods, like avocado are almost impossible for baby to eat with their hands, too. If they show an interest, you could help them with it. Baby-Led Weaning & Choking: Is It a Concern? You’re possibly worried, and rightfully so, about choking. The fact is that it’s always a concern, and it is possible for children to choke during BLW. However, it’s actually far less likely than by spoon-feeding them or putting pieces of food in their mouth! The key to proper BLW is to give them larger pieces of food that they have to gnaw and chew on. What’s good is that the child will be physically unable to bite off a piece of food if they are incapable of swallowing it, which is kind of like nature’s way of protecting them from choking. If you give them finger foods or pointy stuff, that’s when the real danger happens. Now, you should know there’s a difference between choking and gagging. Gagging is actually quite common during BLW, and it’s really nothing to be concerned about. It’s most likely going to happen and it doesn’t mean they’re choking; it helps them move the food around their mouth. A first-aid course is a good idea if you want to be prepared in the case of actual choking. You can likely find one in your area, and some places offer specialized courses meant for babies and children. It could give you some piece of mind! What Are The Downsides of BLW? Of course, it’s not all upsides. The biggest downside and the one most people will tell you about right away is that it’s MESSY. At first food will be in their hands, on the floor, all over their face, maybe even all over you; pretty much anywhere but their mouth. This also means that there’s a lot of waste. The messiness also makes it difficult to know exactly how much your child actually consumed. This is only hard at first, because over time they’ll eat more and more and have less mess. Do you practice baby-led weaning and have some tips to share? How about a question? Feel free to let us know in the comments section below!